William Branham taught that God never had two prophets on the earth as the same time. However, anyone that knows any Bible history is aware that this is totally false. At that time the prophets Haggai and Zechariah son of Iddo prophesied to the Jews in Judah and Jerusalem. They prophesied in the name of the God of Israel who was over them." Not only that, but the life of the prophet Isaiah spanned the ministries of Hosea, Amos, Jonah and Micah. Additionally, Jermiah was a contemporary of Joel, Exekiel, Daniel, Nahum, Zephaniah, and Habbukuk. Finally, Obadiah and Malachi's ministries overlapped. 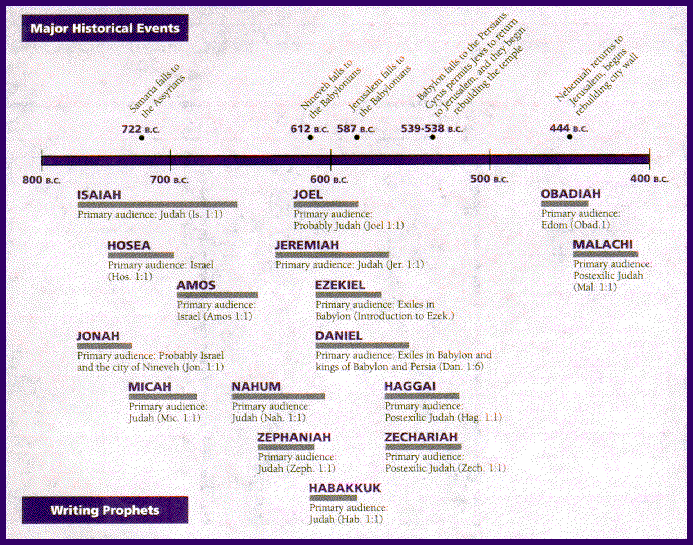 The following is a timeline showing the prophets that ministered at the same time between 800 and 400 B.C. And it's strange, but through the Bible, He never had two prophets, major prophets in operation at the same time. He always had one prophet. Then when He got through with that one, He--taken him away and put another one in his place. Show me one time God ever dealt any way but one single person. He never even had two prophets the same time, always an individual. Men has different ideas. Cope that together, you get a mess. God has one man He works with. There's one Elijah, then Elisha, then a John, on down to Jesus, so forth, right on down. There's a Luther, a Wesley, so forth, just right on down. Now, God always uses a—a prophet, a man. If you use a bunch of man, you get different ideas; see, each man, two man. Never did He have two major prophets on the earth at one time. He takes one, so the other one can take its place for another day, another message. He never has two, He has one at a time. This page was last edited on 19 December 2016, at 22:05.